It feels like it was yesterday that we saw the Samsung Galaxy Ace Plus official announcement and we are already welcoming it to our office. Oh wait – the announcement really was yesterday, which makes us especially glad to introduce this one to you. 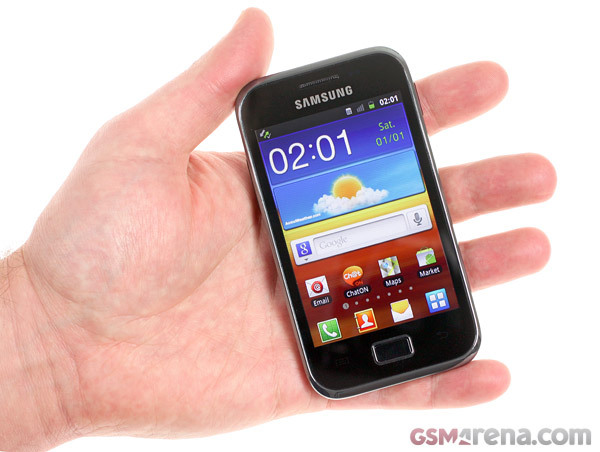 The Samsung Galaxy Ace Plus has some pretty big shoes to fill as its predecessor is one of the most successful products that the Koreans released in 2011. You don’t need to look much further than our own specs page to see that the original Galaxy Ace has been enjoying tremendous interest, so the Ace Plus needs to be quite an upgrade. Of course, we won’t be sure about that until the Samsung Galaxy Ace Plus is finalized and it hits the shelves, but things aren’t looking too shabby at present. A faster ARMv7 CPU and a bit of extra RAM are all that it takes to enjoy the full productive potential of Android. Naturally, there might be some games that won’t feel perfectly at home on the Samsung Galaxy Ace Plus and most of them won’t look particularly good on the HVGA LCD anyway, but that’s not what this handset is all about. The Ace Plus is about maximizing the functionality, while keeping the price to a minimum. Still, great functionality isn’t good for much without at least decent performance, so let’s see how the Galaxy Ace Plus does in that aspect. Naturally, you shouldn’t expect miracles at these stages as what we have here is nothing but an early prototype, which will see plenty of improvement before it hits the shelves. Yet, we are pretty pleased with how stable the Galaxy Ace Plus already feels and we are left feeling optimistic about its prospects. If Samsung gets the pricing right this one might turn out be as big a hit as its predecessor.